Continuing our series of highlighting incredible changemakers who are Getting in the Arena for the causes they care about, we chatted with Dan Thiede, Communications Manager at the Clean Energy Resource Teams (CERTs), to talk about how he and CERTS Get in the Arena for clean energy in Minnesota. 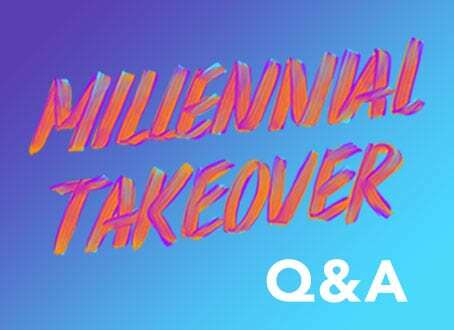 We met Thiede this year at MCON—the Millennial Engagement Conference—where we were celebrating our 20th anniversary and rallying people to “Get in the Arena” around the causes that mattered most to them. At MCON, we partnered with Comcast NBCUniversal who brought along their Chat Box to help capture inspiring stories on video. We invited attendees to jump in the Chat Box and record their answers to the question “How are you using technology and innovation to #GetInTheArena and inspire change in your community?” The chat box was a big hit and we recorded lots of great video stories from attendees about how they are turning their interest into action! Dan was one of these stories. As you can see, Thiede’s story stood out to us as he and his team at CERTs are working on citizen-centered solutions to clean energy and they are reaching beyond their bubble to work with changemakers across sectors. After seeing him in the Chat Box, we wanted to learn more about Thiede’s work with CERTs, how they’re solving local problems, how they build excitement around clean energy and how they’re using technology to do it. Read on to see what he had to say. Can you tell us about Clean Energy Resource Teams and how the organization came together? The Clean Energy Resource Teams—or CERTs—are a statewide partnership in Minnesota that connects individuals and their communities to the resources they need to identify and implement community-based clean energy projects. We have twenty people working across four organizations that spend most of their time doing outreach, education and technical assistance on energy conservation, energy efficiency and renewable energy. CERTs came together in 2003 when people across rural Minnesota began thinking about new opportunities in clean energy and how their communities could benefit. We split the state up into regions and had lots of conversations with everyone from city and utility staff to businesses and nonprofits, from policymakers and school teachers to farmers and engineers. Those early grassroots efforts resulted in regional energy plans, and in the time since we’ve been focused on helping Minnesotans learn, connect and act. What inspired you to “Get in the Arena” to promote clean energy? We’re inspired by the positive economic impacts that saving energy and producing clean energy have, the incredible job growth we’ve seen in the industry (now the fastest-growing part of Minnesota’s workforce) and the transformative effect that projects have on communities when people come together toward a common purpose, have some success and then go even further than we imagined. How does Clean Energy Resource Teams use technology to advance your work? CERTs provides all sorts of resources to Minnesotans in order to help people learn about technologies and models, understand their options and move forward with clean energy projects. Technology plays a huge role in the resources and tools we provide. Key examples include our interactive solar site assessment tool that uses LIDAR, solar resources and weather data to let people know if they have a good place for solar; our online directory of solar companies, community solar gardens and energy auditors; a mobile app that helps people pick out the perfect energy-efficient LED light bulbs; a solar video contest that encourages people to get creative in their efforts to educate Minnesotans about clean energy; and a robust energy benchmarking platform that allows public entities to track their energy usage and compare it to similar buildings. What problem are you hoping to solve and what goals are you working towards? CERTs believes that there are amazing clean energy opportunities out there, but that we have a long way to go to make sure that energy efficiency and renewable energy truly permeate every community in Minnesota. We’re working to tip the scale to make clean energy the norm and to ensure that everyone can benefit from these solutions. How do you build excitement around clean energy and encourage Minnesotans to get off the sidelines and change their habits around energy use? CERTs definitely likes to have fun, we’re solutions oriented, and we believe that action on clean energy is contagious. One of the key ways that we build excitement is through peer-to-peer events, campaigns and recognition. Examples include cities hosting tours for other cities, neighbors getting together to kick the tires on EV cars at the farmers market, students selling LED light bulbs for fundraisers, utilities getting together to talk about successful program models and farmers coming together for lunch to check out the latest in energy-efficient equipment. People see folks just like them taking action, reaping the benefits (and having a great time and they want to do it, too! In most cases there is also money to be made or money to be saved, and real improvements to quality of life without sacrificing comfort. When it all comes together it’s super exciting. How does CERTs’ approach help others to Get in the Arena and be part of the clean energy solution? The Clean Energy Resource Teams empower communities and their members to move forward with energy efficiency and clean energy work by meeting them where they’re at, understanding their unique situation, needs, assets, and concerns, and then ensuring that they have the information, connections, financing and other essentials to see clean energy projects through to their completion. We don’t stop there, either. After they finish a project we publish stories about them, help them celebrate their success, and make sure that they’re on their way to making even more progress toward meeting their energy goals. That’s also usually the point in the process where their peers start to take notice, ask questions and think about how they can move forward with projects, too. It’s contagious in the very best way! Do you have any success stories that inspire you to keep doing this work? We literally come across success stories every week that keep us going, and keep up a blog and send out a newsletter called MN Energy Stories packed with successes every couple of weeks. It’s a steady drip of inspiration for the work that we and so many others are doing every day to shape Minnesota’s clean energy future. It’s particularly inspiring when we’re able to figure out a solution to a tricky problem that opens the floodgates for projects, which is definitely what happened in Minnesota with Property-Assessed Clean Energy—or PACE—financing. Lots of businesses, nonprofits, and other groups were having trouble financing energy efficiency and clean energy improvements, because traditional banks didn’t really understand them. We’ve been working to expand PACE availability in Minnesota, and now just a couple of years in there have been hundreds of projects and millions of dollars of financing, all through property tax assessments. We’d like to thank Dan Thiede for sharing how he’s Getting in the Arena with us. To learn more about CERTs, check out their website. To learn more about our Get in the Arena efforts, and to see what other MCON attendees said about their #GetInTheArena moments, check out our Get in the Arena page. Sam leads all communications and outreach for the Case Foundation, bringing to bear his industry savoir faire as well as good old-fashioned hard work to expand the impact of the Foundation’s work.